Protection For The Steel Industry Is As Old As America The U.S. steel industry has enjoyed protection from foreign competitors since the 1790s. It says new import tariffs are actually just leveling the playing field and shouldn't be labeled "protection." 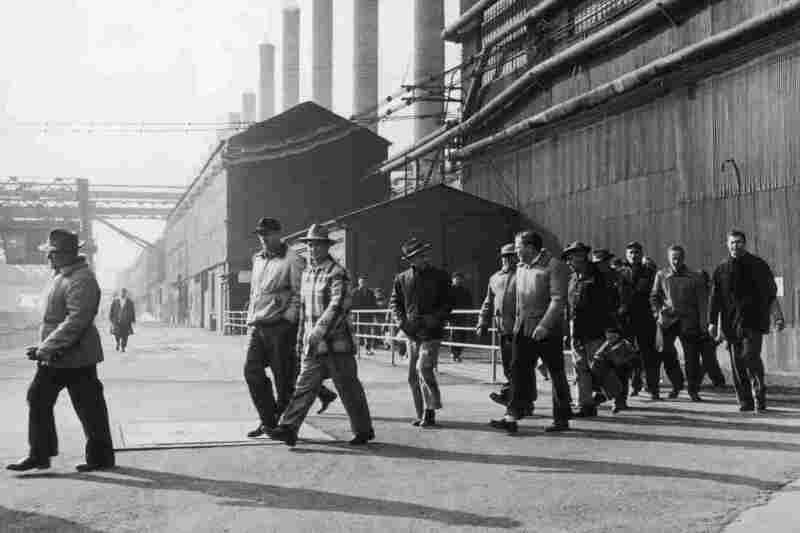 Steelworkers leave a plant at the end of their shift in Bethlehem, Pa., in 1947. Employment in the industry has declined by 80 percent from its peak six decades ago, according to author Douglas Irwin. President Trump's tariffs on imported steel aren't the first time the industry has gotten protection from the U.S. government. Not by a long shot. In fact, tariff protection for the industry — which politicians often say is a vital national interest — goes back to the very beginning of the republic. 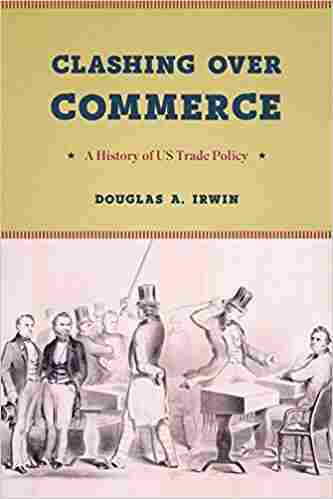 In his book, Clashing Over Commerce: A History of U.S. Trade Policy, Dartmouth professor Douglas Irwin writes that protection for the metal producers began in the 1790s. Iron forges, the forerunners of the modern steel industry, were sprouting in Pennsylvania. Tariffs, or taxes, on imported horseshoes, nails and rifle barrels protected the fledgling industry from foreign competition. A century later, politicians were still making a name for themselves shielding the industry. "There was a guy called William 'Pig Iron' Kelley," Irwin says. The Pennsylvania representative was a champion of iron and steel interests "and always was pushing for higher tariffs in the late 19th century after the Civil War," the author says. Tariffs and other protections for domestic producers have waxed and waned, but World War II made them nearly disappear. The war decimated steel production in Europe and Japan. But U.S. steelmakers thrived, so after the war there was no need for protection. But the industry faltered in the 1970s. U.S. steel companies failed to invest in modern equipment, while foreign competitors rebuilt with the latest technology. The U.S. lost its technological lead and lower-cost imported steel captured nearly a quarter of the domestic market. Outdated U.S. plants were shuttered and more than 100,000 steelworkers lost their jobs, devastating their communities. Irwin says politicians felt their pain. "Just about every president has renewed or extended those special import quotas or voluntary export restraints or various extra, above and beyond the tariff, [ways] of protecting the domestic industry," he says. In the 1980s, the industry was disrupted by mini-mills; high-tech plants that melt down scrap metal to make steel — but with far fewer workers. Then in the early 1990s, Irwin says, the first President Bush began to try to phase out protections and the Clinton administration followed suit. After the Asian financial crisis in the late 1990s, steel imports surged. But the Clinton administration said no to the industry's pleas for protection. Irwin says the administration told the industry: "Those times have passed. You've gotten many years of adjustment assistance and so we're not going to help you." But in the 2000 election, George W. Bush's campaign went to West Virginia and promised help to steelworkers, and his administration re-instituted special tariffs to help the industry. Irwin says politicians are motivated to protect steel because, historically, it's been concentrated in politically important states like Pennsylvania, Ohio and West Virginia. "The reason why the steel industry gets protected is not because it's saving jobs, because ultimately it's not," Irwin says. "It's really saving a very politically powerful industry that history has shown has been very much able to get politicians to act on their behalf." Irwin says, historically, the steel workers union also held sway over politicians. But he says there's another factor at play: the aura of steel as an indispensable industry. That's a sentiment President Trump voiced as he authorized the new tariffs. "Absolutely vital," the president said. "Steel is steel. You don't have steel, you don't have a country." A lot of countries think that way. That's why steel gets protected worldwide. And that's why the new U.S. tariffs are justified, says Roger Newport, the CEO of Ohio-based AK Steel. "This is not protection," Newport says. "This is ensuring that there's a level playing field. We've been in a trade war with China and other countries for a long time and we've been losing it." Newport says his company will continue to invest in technology to compete better globally. But, Irwin says that means jobs will likely disappear. "One thing about competition and technological change," Irwin says, "it's always forcing firms to become more efficient." He says the steel industry has responded "and as a result, the number of worker hours it takes to produce a ton of steel has really plummeted in the United States." In 1980, it took 10 worker hours to produce a ton of steel. Today, Irwin says, it takes only two hours and employment in steelmaking has declined by 80 percent from its peak six decades ago. The Trump tariffs won't reverse that trend, he says.